Well, that’s not how I feel, although the commercial is really, really funny! I don’t want school to start. I don’t want my children to go back to school and leave me all day long. Whaaaaaa! They have been the biggest help to me this summer and I’m going to miss that. Selfish of me? Maybe. But I’ve seen them grow, mature and really do so many selfless things. Once school starts, I won’t have them all to myself anymore like that. Life will just be crazy; I have 4 kids in school, a toddler, a newborn, school schedules to juggle, soccer, piano, marching band, scouts, plus all the stuff I’m involved in that would take a paragraph all on its own. Sigh. There’s no stopping it. School is coming. So it’s time to get ready. My kids love these things. They love to take their little dry erase marker and check things off their lists. It makes them happy. And don’t we all love happy kids? #1. Create your checklist either on the computer or by hand. Don’t forget to include your child’s name at the top. I sound like a school teacher: Write your name at the top of your paper or it goes in the trash! OK, think of all the things your child should do before school, after school and before bed, but make it age appropriate. We don’t want to overwhelm them or they won’t love it. And please, keep it to one page. Ask your child what they think should be on the list; their answers might surprise you! And if your child can’t yet read, include a picture of each thing on your list. Another fun thing to do is to let your child choose their own font (just make sure it’s easy to read) or you can let me decorate it with crayons or markers. We chose to be plain and simple, but there’s no wrong way or right way. #2. Slide it in a sheet protector. Notice I said slide it in. Let’s be gentle with our creations. Why the sheet protector? 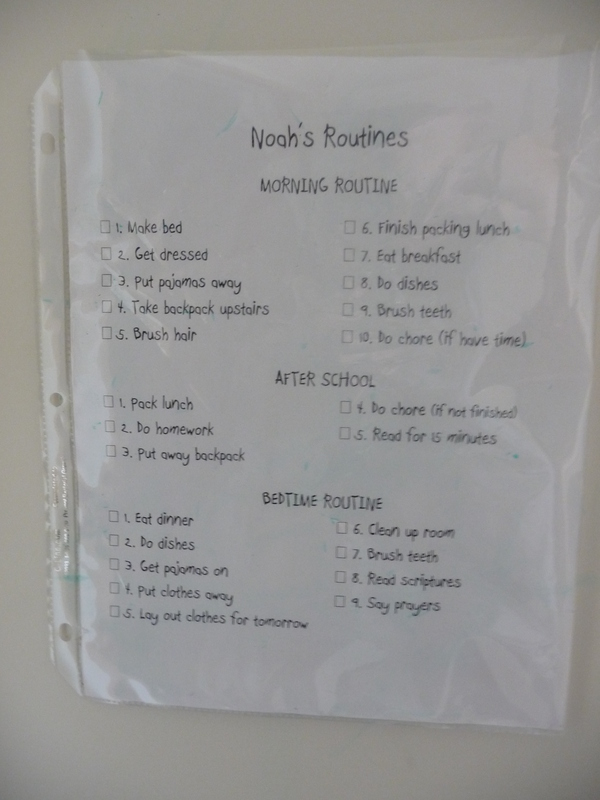 Because this is a very affordable way to turn the checklist into a dry erase board. Look for sheet protectors at craft stores, Wal-mart, Target, etc. You can also laminate it, but when you need to update their list, you’ll have to throw out the old one and laminate the new one. #3. Get out your dry erase markers. Let each child pick their own color. Attach the marker to the sheet protector using string or velcro or any other creative thing you can come up with. Dry erase markers last longest when they’re stored horizontally, so keep that in mind as well. #4. Put it in a convenient spot. Now this needs to be convenient for your child more than for you. If your child can’t find it or reach it, then the checklist becomes useless. Remember, this is their list and part of the excitement for them is that they get to mark things off themselves. Ta-da! Be prepared to be amazed at how much easier it is to get your child ready for school, on time. Don’t ever underestimate the power of a good list! This entry was posted in Back to school and tagged checklists, kids, school. Bookmark the permalink.